Need jump start service in Lancaster Pa for a car that won’t start – call Patriot – St. Denis – RC Towing at (717) 393-8881. Patriot – St. Denis – RC Towing will give a dead battery in Lancaster Pa new life. Our professional drivers will arrive on time to delivery roadside assistance in Lancaster Pa.
Our drivers are equipped with hand-held battery pack jump starters. These “jumpboxes” have 1700 Peak Amps and 425 Cranking Amps of starting power. These “jumpboxes” are perfect for a variety of professional starting environments, including automotive service, fleet service, auto dealerships, auto auctions, marinas, implement dealerships and more. If your battery is one of the so-called low-maintenance varieties, you may not see any filler caps. These batteries claim to never need water added. While it’s true that they have a slightly different chemistry that consumes less water, and the level of electrolyte in the cells is deeper over the top of the plates, eventually these batteries run out of water and die. Look carefully and see if there is a way to pull up a set of filler caps. They may be hidden under a sticker that can be slit open. Others are permanently sealed shut. If the level of electrolyte is very low, suspect a charging system that’s generating too high a voltage. The maximum voltage you should see across the battery terminals with a fully charged battery and an engine running well above idle is about 14.6 volts. Another cause of low electrolyte is excessive heat. Sun Belt drivers should top up battery levels regularly because underhood temps will climb high enough to drive water out of the battery very rapidly, even if the charging system is doing its job correctly. 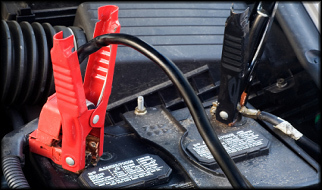 If your vehicle came with an insulator around the battery, be sure it’s in place and in good shape.